Poroshenko says amendments to the Basic Law back on the agenda. 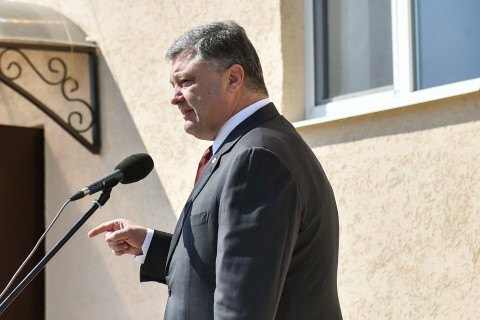 President Petro Poroshenko during his 13 September visit to Dnipropetrovsk region stated hopes the Constitution in terms of decentralization will be amended "in the near future." "Decentralization is the president of policy, which has no alternative. I hope the Verkhovna Rada in the near future and will support constitutional changes related to decentralization," Poroshenko said. The Verkhovna Rada in August 2015adopted in the first reading the draft amendments to the Constitution in terms of decentralization. However, the bill contains a paragraph on the peculiarities of local government in some regions of Donetsk and Lugansk regions (the so-called "special status of Donbass"), which is opposed by a large number of deputies. The draft bill provides that in the 18th paragraph of the transitional provisions of the Constitution will contain a provision to the effect that "the peculiarities of local self-government in certain areas of the Donetsk and Lugansk regions are laid down in a separate law." In summer, Poroshenko said that the Verkhovna Rada will vote for changes to the Constitution in terms of decentralization only after the withdrawal of Russian troops from the Donbass. He reiterated the idea in his address to the Parliament on 6 September. Should the parliament want to exclude this provision from the draft bill, as, for example, has proposed the Interior Minister Arsen Avakov, it will need to be re-submitted to the Constitutional Court for re-assessment and two parliamentary readings in two different sessions.